Roulette Cam Chat: Apple store banners causes Security Guard confrontation!! 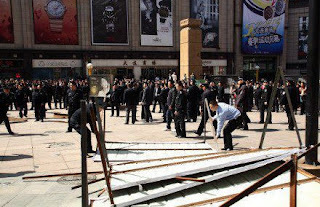 Apple store banners causes Security Guard confrontation!! Yup, the erection of some billboards for a new Apple Store seemed to push the buttons on a Chinese Department Stores security guards and it wasn't long before they demolished the advertising boards. Obviously not part of the fanbois pack and doubt they'll be applying for any security guard positions at the new store. Stevie J must be turning in his grave.